It has long been clear that efforts to reintroduce salmon and steelhead above the Pelton Round Butte Hydroelectric Project are altering the Deschutes River’s ecology below the dams. The transfer of Lake Billy Chinook surface water to the lower river, through the Selective Water Withdrawal tower, has led to nutrient enrichment, nuisance algae proliferations, and subsequent impacts to aquatic life in the river’s lower 100 miles. Now, a new report from U.S. Fish and Wildlife Service and PGE indicates that the fish reintroduction program is also negatively impacting Deschutes Basin ecology above the Pelton Round Butte Project. According to the report’s authors, hatchery steelhead are replacing native redband trout in Whychus and McKay creeks, two important tributaries where the hatchery fish are released as part of the reintroduction program. This is the second study to find such replacement of natural-origin fish in the upper Deschutes Basin: a 2015 report from U.S. FWS and the U.S. Forest Service also found that hatchery steelhead from the reintroduction program had largely replaced native redband in Whychus Creek. Since 2007, juvenile hatchery steelhead have been released in Whychus Creek—a main tributary of the upper Deschutes River—as part of the Pelton Round Butte fish reintroduction program. In the Crooked River tributary McKay Creek, releases began in 2008. In total, nearly 7 million hatchery steelhead juveniles have been released in the upper basin since the program began. Before these hatchery releases began, both McKay and Whychus creeks had important populations of wild native redband trout. However, it is well understood that wild populations can be heavily influenced by hatchery releases, either through interbreeding or through competition. The new report from U.S. FWS and PGE examines the impact that hatchery steelhead releases have had on the wild populations in Whychus and McKay creeks. Interbreeding between hatchery fish and wild, natural origin fish can have severe impacts on the fitness and reproductive success of a naturally-spawning population. This can occur either through competition, or by decreasing the population’s genetic diversity (and thus ability to adapt). For those who value healthy, adaptable populations of native redband trout in Whychus and McKay Creeks, this report’s conclusions should be of great concern. This study also illustrates another troubling impact on the basin from current fish reintroduction efforts. 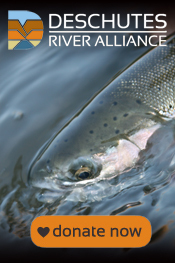 DRA has long supported the goal of returning salmon and steelhead to the upper Deschutes basin, but these efforts simply cannot come at the expense of native fish populations—or the health of the lower Deschutes River. DRA will be studying these results closely in the coming weeks, and asking tough questions of the agencies responsible for native fish management. The Oregon Department of Fish and Wildlife, in particular, is responsible for managing Oregon’s native redband trout pursuant to the Native Fish Conservation Policy. That Policy identifies ODFW’s principal obligation for fish management as “conservation of naturally produced native fish species in the geographic areas to which they are indigenous.” We believe it is time for ODFW to take a close look at how Pelton Round Butte operations are impacting native fish in the upper Deschutes Basin. ← Poor Fish Returns to Pelton Round Butte, Part 2: Where Do We Go From Here?